How satisfied are you with your recent visit to our store? After the participants have all taken this survey, the points from their answers can be summed and averaged. This would let you, the survey designer, better quantify how people feel about their store visit. 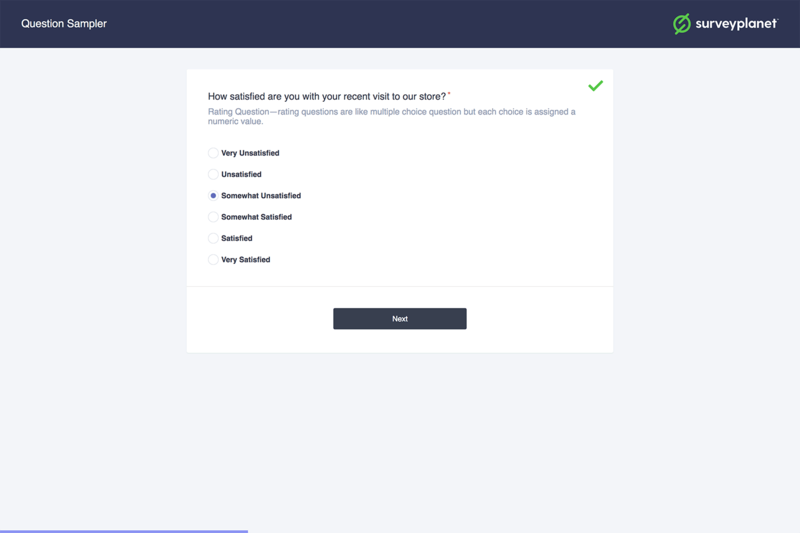 When you create a rating question, you’ll need to include at least two choices as well as a point value for each choice. The participant will never see the point values; they're strictly for your own analysis. Click in the Value input field and add the value amount you would like to use. This can be any number you choose. Click in the New Choice input field next to that value and input the choice label you would like to use. Once you begin typing in this box, a second choice and value box appears. Repeat steps 1 and 2 until you have entered all the choices you need. To delete a choice and value hover over the choice you want to delete until you see the gray X appear in the right side of the Choice box. Click the X to delete that choice. Hover over the choice input for the choice you want to move up or down. A Move icon will appear on the right side. Click and hold the Move icon . Drag the choice to its new location. Repeat this for all the choices you want to move. Note: this moves both the choice and the value associated with that choice. We’ve included some of the most common rating templates: Agree/Disagree, Satisfaction, Likely and Rate. You can use these templates as they currently are or modify them however you see fit. There is also a fifth template: Test Question. 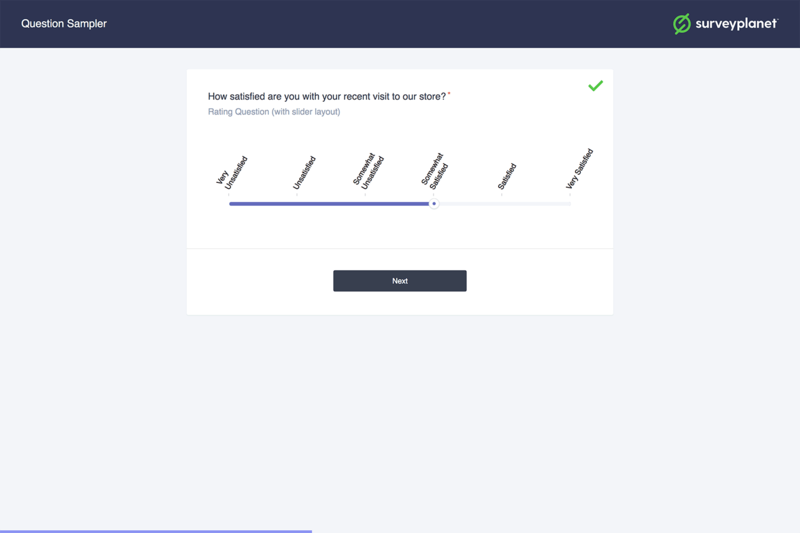 The Test Question template lets you create scored multiple choice tests by assigning a point value only to a correct choice. Click the drop down arrow for the Template box. When you select a template you will see that the choices change to reflect the template chosen. You can sort your rating choices either alphabetically (Ascending by Title or Descending by Title), by point value (Ascending by Value or Descending by Value), in the Original Order in which they were typed or Random. By default, your rating choices are sorted to display based on descending point value. To choose a Sort Order click the drop down arrow for the Sort Order box and select the sort type you would like to use. By default, your choices will be listed in a single column. You can choose whether to show your choices in one column, two columns, three columns, four columns or in a slider format. To choose a layout option, click the drop down arrow for the Layout box and select a layout type. The slider layout changes your choices to go horizontally along a slider. The survey participant then drags the slider button to their choice.